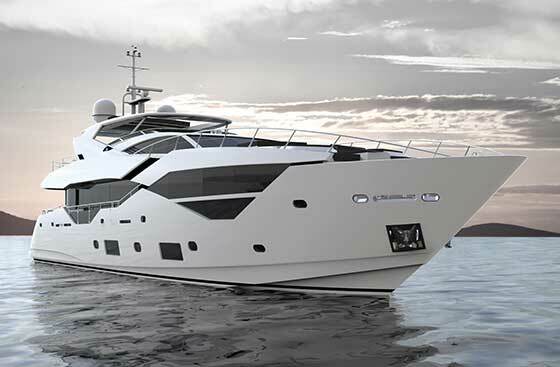 Sunseeker International has released the first exclusive CGI images of the eagerly anticipated new 116 Yacht currently under production in Dorset, UK. The stunning next generation superyacht is set for launch in Spring 2016. Its elegant lines, open plan layout and stylish interiors showcase the new design direction that Sunseeker's next generation of 100ft+ models will take. It also underlines the group's commitment to bringing more exciting new products to market, and continuing to invest in cutting edge technical and design innovation. The 116 Yacht shares the proven engineering platform of the hugely popular 115 Sport Yacht, but brings a spectacularly reimagined new deck and superstructure design. The new images give a tantalising first glimpse of the rakish looks and unique design layout that make this the ultimate boat for entertaining in style. In keeping with that theme, the foredeck has been developed into a whole entertainment area of its own, with a new ‘Club' concept and the option of a large hot tub. The flybridge itself boasts a huge retractable sunroof and an exceptionally generous seating and dining area, with space for a wet bar, sun-loungers, companion helm seating, and standard hot tub. An electronically operated carbon fibre gull-wing door also provides easy access for crew from the wheelhouse to the exterior side deck. Inside, the 116 Yacht's most eye-catching new design features include larger and lower windows in the full beam master stateroom, creating bigger, brighter owner's accommodation affording maximum privacy. Full height glass in the saloon also combines with sleek cut away deck bulwarks to flood the living accommodation with natural daylight, bringing an astonishing sense of size and space to the interior for a yacht of its size. The aft cockpit lounge area, bar and bathing platform is designed with a sociable ‘Beach Club' feel in mind. Extra touches like the platform level seating and hidden platform shower give it everything owners and their guests need to relax and enjoy the water in style and comfort. The stern garage has plenty of room for a large tender and two jet skis. Based on the classic Sunseeker deep V hull, the 116 Yacht still has performance at its heart, whether cruising at 16-18 knots or sprinting at up to 26 knots (depending on engine option). Standard guest configuration is for ten guests in five cabins, with up to five crew, but this can be flexed depending on the layout and options selected. Sean Robertson, Sales Director at Sunseeker International said: "Sunseeker prides itself on producing the world's finest luxury performance motor yachts, and the new 116 Yacht achieves that goal in stunning fashion. Its striking lines and more open plan layout hint at the new design direction that will influence our new crop of 100ft+ models, but it remains quintessentially and unmistakeably a Sunseeker. "Like all our next wave of superyachts, every element of the 116's design and layout can be individually tailored through our unique ‘Bespoke' service, which we've developed to meet the needs of all our discerning customers around the globe. As the second of two larger models we have set for launch in early 2016, it really highlights our commitment to keep investing in exciting new models which lead the way in technical and design innovation; providing our customers with the best possible choice within their chosen size range."